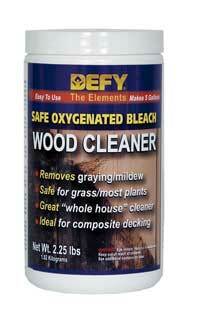 Defy Wood Cleaner has the best deck cleaner ratings compared to most chlorine bleach deck cleaners. This oxygen bleach wood deck cleaning solution is highly effective at removing dirt, grime, mold, algae, and weathered graying from wood surfaces. Defy Wood Cleaner is a safe, powdered, oxygen bleach concentrate that is mixed with water to safely clean and restore the natural beauty of exterior wood. Unlike chlorine bleach based cleaners, this oxygen bleach wood deck cleaning system is environmentally safe and biodegradable and will not harm wood fibers, pets, grass or most plants. Using a chlorine bleach will not only harm the wood as well as the vegetation surrounding the deck, but it will not actually clean or remove any stains, it just bleaches them out. When you use Defy Wood Cleaner, you can actually see it work as it foams up and penetrates down to the pores, giving your deck a thorough cleaning that a chlorine bleach deck cleaner could never hope to accomplish.